CREAM COLOR - Open Box return. May be minor cosmetic scratches and dings. Fully checked and factory tested to be in perfect working order. 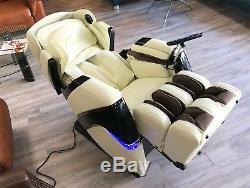 Cream Color Osaki Pro-Cyber Executive Zero Gravity Massage Chair Recliner Osaki OS-3D Pro Cyber Zero Gravity Massage Chair Recliner Experience the most human like massage from the Osaki OS-3D Pro Cyber Massage Chair. The new evolved next generation 3D massage rollers are designed for outstanding range and flexibility. The 3D technology allows you to extend out or protrude the massage heads up to 8 mm for a super deep massage. With the 3D technology, reaching and massaging the acupuncture points becomes effortless with better precision and depth, leaving you revitalized. 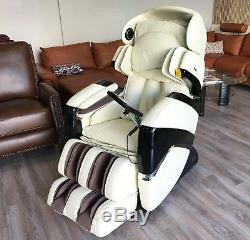 Additional exclusive features of the Osaki OS-3D Pro Cyber Massage Chair Recliner include. 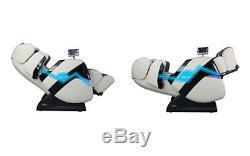 Evolved 3D Massage Chair with 2 Stage ZERO GRAVITY. Computer Body Scan 3D Technology. 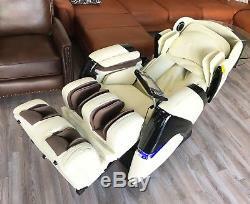 36 Air Bags throughout the massage chair with Next generation Air Massage Technology. Auto Recline and Leg Extension. Shoulder, Lumbar and Hip Squeeze and Twist. Full Size Easy to use Remote Control. 9 Different Pre-Set Massage Programs. 5 Levels of intensity for the 3D Massage. 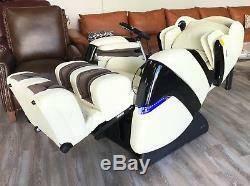 5 to 30 minute Auto Massage Program timer. Durable synthetic leather has the look, feel, and comfort of real leather. 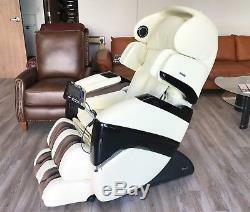 Dimensions: Upright Approximately - H. Dimensions: Reclined Approximately - H.
Osaki OS-3D Pro Cyber Massage Chair Zero Gravity Recliner Video. 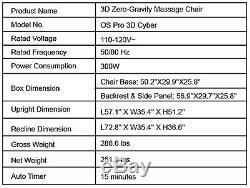 OSAKI MASSAGE CHAIR COMPARISON CHART. We accept most major credit cards in our showroom. Years 1-2 cover the parts only. There are no In-Home Service Technicians for Osaki in these remote locations. 2 and 5 Year Extended In-Home Parts and Labor Warranties are also available in the continental USA for these chairs. 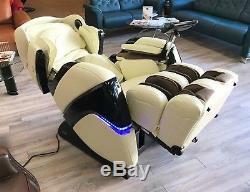 The item "Cream Osaki Pro Cyber Zero Gravity Massage Chair Recliner with One Year Warranty" is in sale since Sunday, October 14, 2018.